He played his final game some 17 years before I was born, but if you’re going to have a baseball website and you’re going to marry into a Yankees family, you’re going to do a post to bid adieu to the guts and glue of some of the greatest Yankees clubhouses of all time. Yogi Berra is often remembered for his ‘Yogi-isms’ and everyone loved the guy. He was a great human being by all accounts, an ambassador if you loved baseball. You could not think of Yogi if you knew the game without a fond thought. Lost in all this is that he was a lifetime .285 hitter with a formidable .830 OPS. Pretty good numbers for a guy who caught 1699 games. And then comes the part where; I married a New Jersey girl. Yogi Berra resided in the town next to where my in-laws live. Many times when I run on the beautiful boardwalk out there, I have my eyes up and I’m looking for Yogi. I’m told he used to take his early morning walks out there and I might see him if I’m alert. I never saw Yogi. But I still felt his heroic presence when I would eat breakfast in many of the Yankee decorated diners out there. He passed away 11 years to the day that I started dating my wife. One of the greatest Yankees ever is now in the ballpark cathedral in the sky. 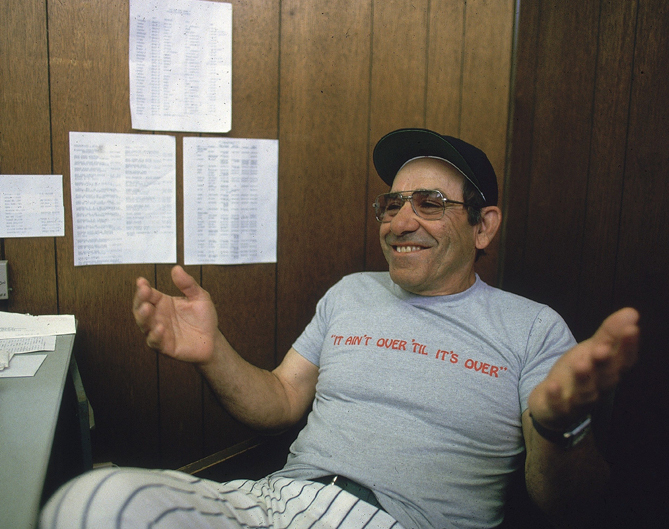 Rest in Peace Yogi Berra, from 1925 to 2015 you kept it loose.